International Journal of Accounting and Taxation is a double blind peer reviewed journal that publishes original research papers using analytical, empirical, experimental, and field study methods in all areas of accounting research. 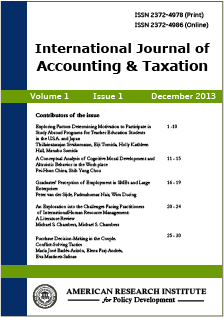 The journal publishes original scholarly papers across the whole spectrum of accounting and taxation. The contributions are welcomed across a wide range of research methodologies (e.g. analytical, archival, experimental, survey and qualitative case methods). Each paper will be judged according to international standards within its topic area, the originality of its contribution, its relevance to development of the subject and its quality of exposition. All papers are subject to a minimum of double blind refereeing. International Journal of Accounting and Taxation provides a forum for the publication of high quality accounting research manuscripts. The journal attempts to assist in the understanding of the present and potential ability of accounting to aid in the recording and interpretation of international economic transactions and taxation practices. The journal recognizes that international accounting is influenced by a variety of forces i.e. governmental, political and economical. Each paper published in International Journal of Accounting and Taxation is assigned a DOI®number, which appears beneath the author's affiliation in the published paper. Click HERE to know what is DOI (Digital Object Identifier)? Click HERE to retrieve Digital Object Identifiers (DOIs) for journal articles, books, and chapters. Dr. Bo Ouyang, Pennsylvania State University, USA. Prof. Yousef Jahmani, Ph.D., CPA , Savannah State University , USA. Dr Dimitrios Vortelinos, Dept. of Accounting and Finance, University of Lincoln, UK. Dr. Abeer Hassan, University of West of Scotland, UK. Dr. Kadir Dabbagoglu, Halic University, Istanbul, Turkey. Prof. Dr. Abdulnaser Nour, Middle East University, Jordan. Dr. Percy MD PHATSHWANE, University of Botswana, Gaborone, Botswana. Prof. Enyi Patrick Enyi, Department of Accounting, Babcock University, Nigeria. D. Badir Alwan, Dept. of Accounting, Philadelphia University, Jordan. Dr. Adel Mohammed Sarea, Department of Accounting , Ahlia University of Bahrain. Dr. Mahmoud Aleqab, Prince Sultan University, Riyadh, KSA. Dr. Ruchita Verma, Central University of Rajsthan, India. Dr. Shamsi S. Bawaneh, Princess Sumaya University for Technology (PSUT), Jordan.